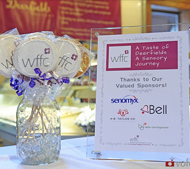 The WFFC Chicago experienced the ultimate sensory of taste to remember! 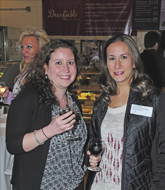 On Wednesday, April 22nd the Chicago Chapter held "A Sensory Journey - Taste of Deerfields" at Deerfields Bakery in Buffalo Grove, Illinois. 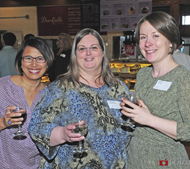 54 attendees enjoyed an absolutely delicious homemade style Italian cuisine from John and Emerald Sciarretta‘s "The Italian Kitchen." The group delighted in traditional recipes enjoyed over 50 years. 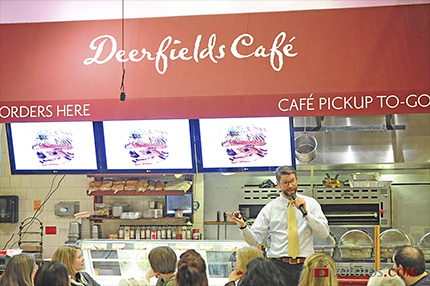 Dinner was accompanied by charismatic and comedic Tim Schmitt, who presented the history of Deerfields family owned bakery. Tim discussed the fact that he came from a long line of hard working farmers and bakers. Through his experience of founding Vistage International, top leading CEO and Executive Coaching and Mentoring organizations, Tim was able to successfully manage and grow Deerfields Bakery. To end the evening, the group savored a "wedding cake tasting," which included multiple cake and frosting flavor combinations. 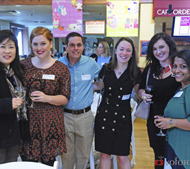 It was a delightful evening enjoyed by all! 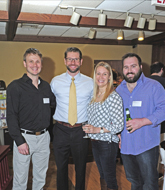 The WFFC is thankful to all members for their continued support and making this event a success. 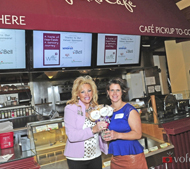 The event was made possible through the generous partnerships with Bell Flavors & Fragrances, Belle-Aire, H.B. Taylor, and Senomyx.